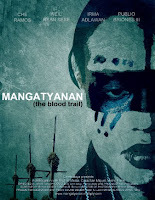 We are fortunate that Robinson's Galleria showcases at least one indie movie weekly and lucky enough, we were able to catch "Mangatyanan (The Blood Trail - Part 2 of the CAMERA Trilogy)". This is one of the entries of Cinemalaya 2009, equipped by a promising director Jerrold Tarog. Even though this movie didn't win any of the major awards (although we hear that the lead actress in this movie, Che Ramos came close to winning the best actress award), we've been wanting to see this first among the other entries ever since we saw its trailer. Let's see of "Mangatyanan" is worthy of all the good feedback we've been hearing. Himalaya (or Laya) is a professional photographer who has chosen to shut herself out from everyone else. She finds out that her Father is dying and still, she refuses to even go and visit him. Laya's mother (Irma Adlawan), who left her when she was young comes back and begs her to go and see him. It is during this time when Laya is sent to a province to live with a dying tribe, in order for her to document a ritual called "Mangatyanan". It is here among the tribe wherein she learns how to face her dark past that she's been hiding for years. "Mangatyanan" is surprisingly good. A film that will suit those who are only out to enjoy a good film without much pretensions or even to those who like a philosophical mishmash that will make them think. The scenes are very well-thought off - some scenes even have an artistic tone and have deep connections by the end of the film. The story is also unique and a sigh of relief to what we often see in cinemas. The final piece of the puzzle is the great acting from the cast especially Che Ramos. The only problem we see is that the film had some audio inconsistencies and some people may find the film too slow.